Players angry at their opponent can (and do) waste the full 90 seconds for every turn, adding up to 15-20 minutes over the course of a game. Since players are not penalized for being away from their computer, they can play other games while they play Hearthstone, or cook food, or talk to their friends. These kinds of activities can frustrate their opponent who must wait. The vast majority of Hearthstone players do not require 90 seconds for all turns. The early turns usually require about 5 to 15 seconds. 90 seconds is just a catch-all that aims to be a reasonable amount of time for the completion of all turns. However, the 90 second timer also fails because it doesn’t provide adequate time for some turns. Players who use the ever-popular “Miracle Rogue” deck frequently have one or more massive “combo turns” in which they play a series of many cards (often a dozen or more) and have numerous difficult decisions to make based on random card draws that happen throughout the turn. Players frequently feel very rushed during these complicated turns (in part due to having to wait for the slow-paced animations that play after every action, and cannot be turned off). On this point, a quick fix that Blizzard could implement would be to make animations play faster after several cards have been played in the same turn, or after the turn has ended. It would also help if animation speeds could be standardized so that no cards remain unusually slow. Overall, these changes would not be troublesome for casual and first-time players that enjoy the current pace of the animations. In Magic Online, the time control is different: there is no increment per turn. Instead, players are given a fixed timebank of 25 minutes for the entire match (a best of three series in which two or three games are played). This is more fair in the sense that players get a fixed amount of time for the entire match, and can spend more time on longer “combo turns” if need be. The main problem is that players often don’t want to use the whole 25 minutes for one match—typically, the median time used is closer to 12 minutes. As with Hearthstone, the lack of a penalty for using more time than necessary encourages players to be away from the computer or engage in double and triple drafting—a practice where players open multiple games at once, even though they can only play one at a time. This frustrates their opponents, who have to wait unnecessarily long for them to play their turns. Again, the blame should not be placed solely on the players who choose to engage in these practices. The time controls in place incentivize these negative behaviours. However, poker does do better in the sense that there is a timebank that lets players think longer during key turns (in this example, up to 4 times longer.) The timebank doesn’t slow down typical turns where players have bad cards and make simple folds. Overall, this hybrid time control does much better at conforming to how players actually play the game, limiting the potential for bad behaviour. There are many time controls used in Chess, but a typical scheme for “Rapid” play might work as follows: there is an increment of 10 seconds, and a timebank of 15 minutes, with a 100% savings rate, meaning that all unused increment time is added to the timebank, allowing players can build up a larger timebank by playing their turns in fewer than 10 seconds. Shorter or longer controls are used in blitz or tournament play. Online blitz games frequently use no increment at all, which works well as the problems plaguing Magic Online are vastly diminished when matches only last a few minutes. When using a time control in which unused increment time is added to the timebank, players are strongly incentivized to play quickly. Given the culture surrounding live chess, players seldom encounter negative experiences relating to the time controls, even when timebanks of an hour or more are used. However, the chess system may not be appropriate for online games, especially those in which players frequently act abusively toward one another when given the chance. 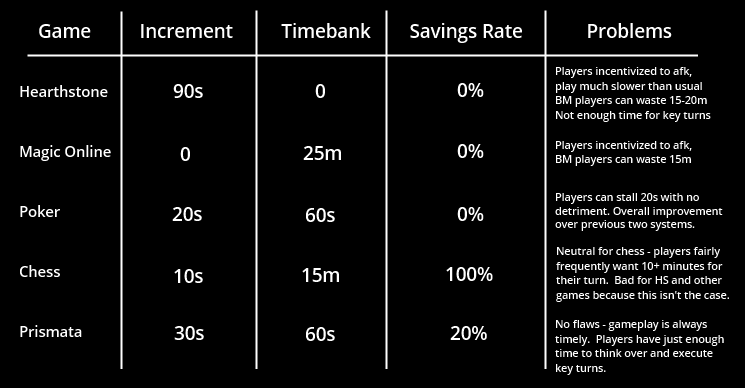 In games like Hearthstone, a chess-like system could be adapted: for example, players could have a 30 second increment, a 60 second timebank, and a 100% savings rate. However, there’s one large problem—banking too much time can lead to a “long turn” that’s just too long. With the example time controls listed above, players in Hearthstone could easily build up a timebank of four minutes or more by playing rapidly during the early turns of the game. While this might be helpful for players of the “Miracle Rogue” and other decks that require long “combo turns”, it leaves their opponents waiting a long time to play their next move, amounting to a moderate disruption. Worse, it could become a weapon of trolls who, upon reaching a losing position, could leave their computers and force the opponent to wait several minutes before claiming a win. It might seem that there is no time control system that simultaneously encourages players to play quickly, allows players to take more time when necessary, and limits the potential for trolling or disruptive play. However, after much experimentation and testing, we’ve found a solution that performs much better than most available time controls in online games. In Prismata, we use an increment of 30 seconds, a timebank of 60 seconds, and a 20% savings rate. This means that 20% of all unused increment time is added to the timebank, which is enough to gently reward players for playing quickly, but not enough to allow players to build up a massive timebank that could be used to play an extremely long turn. Of course, the choice of 20% is game-dependent and could be chosen differently for different games to achieve different objectives. For example, in Hearthstone, if a 50% savings rate was used with a 30 second increment and 60 second timebank, then players of the “Miracle Rogue” deck would have about 2 minutes and 50 seconds to complete their “combo turn”, instead of 1 minute and 30 seconds. Prismata’s time control system is incredible because it does an amazing job of conforming to how players actually play the game and limits the damage that players can do by wasting time. Compared to Hearthstone’s, it solves a lot of key problems: it corrects slow early turns, heavily discourages players from being away from their computer, and vastly limits the frustration and wait (sometimes an absurd 15-20 minutes) that players can encounter if their opponents want to waste their time. It also allow decks like “Miracle Rogue” to play a reasonably long “key turn” if they play quickly in other turns. In all forms of turn-based gaming, there must be rules that dictate how a turn is actually played. Unfortunately, many of these rules have resulted in unwanted negative consequences. Going forward, we hope that game designers will take these factors into consideration and work to develop the systems that are not only the most fair, but the most fun.